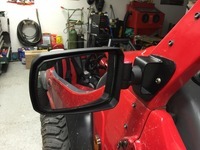 So saw a couple Reepers for sale that had the Pursuit Sezmik HD fold flat mirrors installed (Polaris looking mirrors) from a dealer and for the life of me I can't figure out how they mounted them. 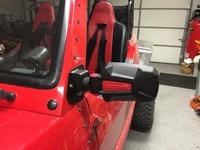 Here is a link to the mirrors, any suggestions on a way to mount these? Awesome!! Mod, can you move this to exterior, just I realized I put this in interior by accident. Yes, and they are great. Large view area. crash61 you up for fabricating 4 sets, Maybe 6 (so 12 total)? My shop is at my weekend home and I have other projects that I am doing with my short time there. Maybe in the near future I would be Able to devote some time to it. Looking at the mount he made is simple, if you have access to a welder & can weld Matt. Maybe take a pic of it to a fab shop & see if they can make some for you. That mirror mod looks great. I would be interested in them. As my left mirror has no glass. You can replace the glass as I showed in this thread. Its not to hard to do and you just buy a cheap mirror at the dollar store to make a new one. The Glass and what ever it was mounted to is gone. See if Crash will sell you one or both of his old ones cheap? Send him a private message and see? If you find time you got a customer . No rush for these as at the rate people break things I'll have new machines by then lol. I will be working on making these brackets in the next few weeks to work with the mirrors. I haven't found a source to get the mirrors wholesale so will only be selling the bracket to work with these mirrors. It will be up to the owner to order the mirror to fit. You can buy mirrors and brackets that are a perfect fit at sun coast trailer sales.com. I bought a set from them for my epic and love them.